3 bedroom end terrace cottage, built in the early 1800s, comprising 1 double bedroom, one twin/double and a single. One bathroom with shower, bath and WC and separate WC. Lounge and kitchen / diner downstairs. There is a patio area outside the front of the property, an enclosed kitchen courtyard to the side with BBQ and chiminea. There is also a decking area above the property to the rear with fantastic views of the Derwent Valley and Riber Castle. Free internet provided and there are plenty of board games and DVDs in the lounge. The kitchen is fully equipped with electric oven and hob, dishwasher, microwave, tassimo coffee machine and washer dryer. The property is situated on the hillside below the Heights of Abraham and within easy walking distance of Gullivers Kingdom. Access to the cottage is via a steep footpath and no road runs directly past the cottage. You can drive to within 50m or so to drop off your luggage. There is a free parking space provided at Temple Mine 200m away but no permanent parking available at the cottage itself. A great tranquil location for walkers, with a footpath starting right outside the cottage and leading to Heights of Abraham, Matlock or Cromford and beyond. Due to its location the cottage is not really suitable for anyone with reduced mobility due to the steep footpath leading to the cottage or for under 4s due to steep staircase and no stair gates. Available to rent from a minimum of 2 nights. Parking space provided at Temple Mine (200m from cottage) Lockable garage on request. Single garage with adjoining parking space. 200m from cottage. Really enjoyed our stay at this lovely quirky little cottage with beautiful views. The trek up to the cottage is not for the faint hearted! Had everything we needed/nice homely touches/very well equipped kitchen and soooooo many DVDs for all tastes and ages. Thank-you for your feedback - we really appreciate it. Thanks for alerting us to the dog blankets - we will rectify this. We had a delightful stay here for a couple of nights this spring. It is a charming cottage, full of character and tastefully decorated by the owners. There were lots of little thoughtful extras that made our stay even better. Brilliant location, close to all amenities. 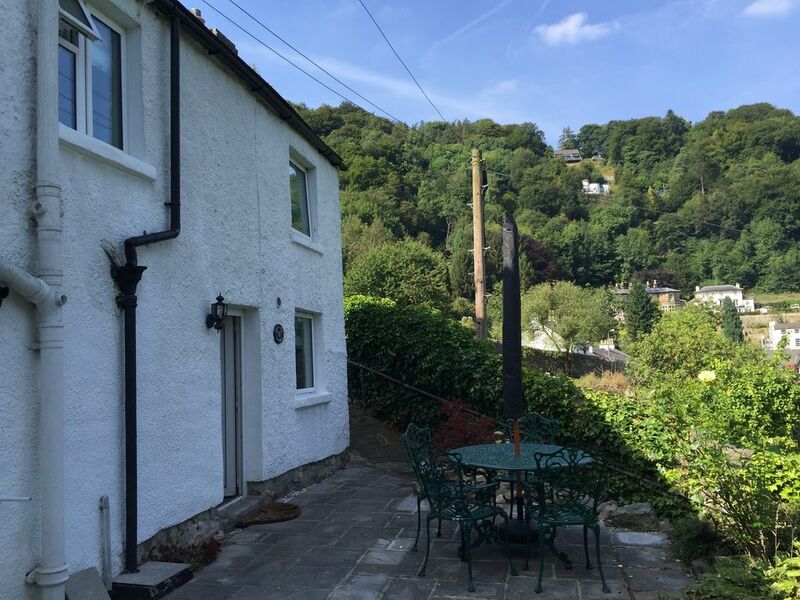 Beautiful views over Matlock bath from the comfort of a lovely cosy home from home, with everything we needed and lots of little extras. What an amazing place this cottage is... great views over Matlock Bath. Inside you have everything you need... its desinged beautifully... you really do feel you have escaped this mad world when inside. The fact that it was dog friendly was a plus for us, the cottage smells real nice and is well kept to a high standard. The location is perfect, great pub at the bottom of the hill (FishPond) and a great Chinese Restaurant/Takeway around the corner from the pub. If you are looking for a place of peace... this is it! Highly Recommend !